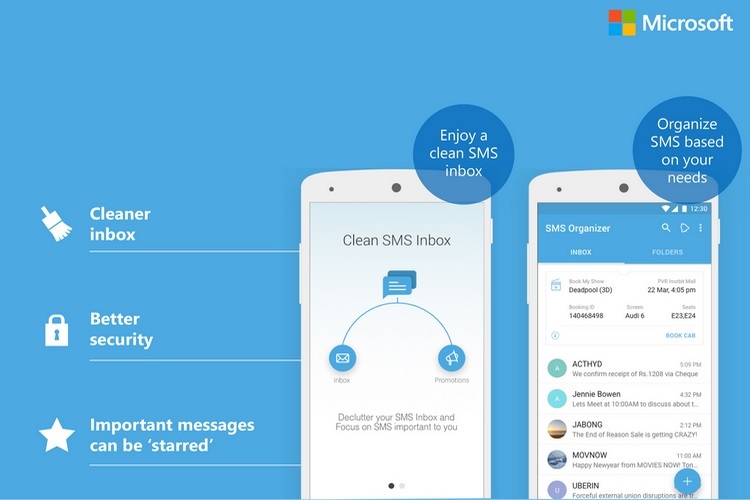 Microsoft’s SMS Organizer for Android is a highly efficient SMS app that your SMS inbox by weeding out spam, automatically sorting texts into different categories, and sending reminder cards among a host of other useful actions. In a bid to make its SMS app even more productive, the company has rolled out a new update which has brought the ability to track an individual’s funds and bank accounts to the app and has also added a couple of other nifty features too. A product of the software giant’s experimental Garage division, with the latest version (v1.1.50), it becomes much more than just an SMS handler. Thanks to these newly added features, the app can easily track a user’s bank accounts and e-wallets by saving important data like account balance and credit/debit balances to create a virtual passbook. This would include all information about your withdrawals, spending and deposits. Moreover, to protect an individual’s personal data, Microsoft has also added another layer of security to the financial documentation feature which allows users to set a password or use their fingerprint pattern to safeguard their financial data from any intrusion. We love the SMS Organizer app a lot, and cannot stop recommending it to anyone with an Android phone in India – the app is specifically made for India. The latest update also improves the machine learning-based SMS classification algorithm. You will also be alerted for various reminder, that are set automatically by the app, notifying users about upcoming events like bill payments, travel bookings, etc.